A book from Island Press, edited by Catherine Rich and Travis Longcore. Order now at amazon.com to support The Urban Wildlands Group. Click here for news, updates, and discussion. "Ecological Consequences of Artificial Night Lighting is an excellent reference that will undoubtedly raise awareness of the need to conserve energy, do proper impact assessments, and turn the lights down." "It should be a primary source for anyone dealing with work related to lights and their impacts on living organisms. It's on my primary source reading list." "Anyone interested in how human civilization affects natural environments will want to see this book; the literature reviews will be a treasure-trove for biologists beginning to learn about the problems." "This is a book with a mission and a soul. At the front of each part is an extract of prose from one of a variety of authors that make us remember that nights are meant to be dark, beautiful and exciting. It is an academic book, but one that is written and presented in such a way that it will appeal to anyone with an interest in ecology." "The book is seminal in its field. It comes at a most opportune time, when our entire social system revolves in myriad ways around brighter lights.... The articles in this volume are meant to unsettle the common perception that more light is indicative of a higher level of development. It brings forth ecological ramifications, drawing upon a variety of fields such as geography, physics, and biology. Well researched and well written, the articles open up doors to further research in the field, giving ample opportunities for multidisciplinary approaches towards environmental issues. It has also served to bring the concept of light pollution into mainstream thinking regarding pollution, an agenda hijacked by the more pressing problems of air and water pollution. The book is a must read for students, academicians, and laypersons alike." "This book is very readable and should be of interest to a wide audience, ranging from professional biologists and managers to students... Conservation practitioners will find strong support for the need to incorporate artificial night lighting into impact assessments and conservation planning." "A powerful compendium. Surely eye opening for many ecologists. ... 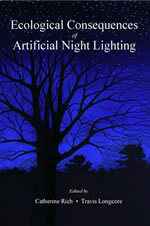 Recommended for wildlife ecologists and anyone fighting light pollution." "The adverse effects of night lighting on the environment have only come to the attention of scientists during the last fifty years. This intriguing book, edited by Catherine Rich and Travis Longcore, brings together historic accounts and recent scientific findings in a broad spectrum of writings on the significant influence of night light on plants and animals. Divided into six parts according to taxonomic groups, the text documents seminal studies showing that overabundant artificial lighting has played a role in the lives of plants and animals by disrupting regular rhythms and creating serious hazards for fauna. In conclusion, the editors offer a thought-provoking reminder, '...as we light the world to suit our needs and whims...doing so may come at the expense of other living beings ... .'"
A reader might anticipate from its title that Ecological Consequences of Artificial Night Lighting holds a in-depth technical focus on night lighting's impact on nature - but it goes beyond chronicling science to consider how human activities from lighting affects animals and plants in a variety of ways. 'Photopollution' exists nearly everywhere thanks to mankind's activities: here are examples not only of effects on plants, insects and animals but how to mitigate them. Sections seek a readable approach by pairing vignettes of events and experiences of nighttime creatures with plenty of science and analysis of the physiological and behavioral effects of light pollution. It's these vignettes which make this book accessible not only to college-level students of science, nature and ecology but the general non-scientist public library browser, as well. While certain ecological problems associated with artificial night lighting are widely known -- for instance, the disorientation of sea turtle hatchlings by beachfront lighting -- the vast range of influences on all types of animals and plants is only beginning to be recognized. From nest choice and breeding success of birds to behavioral and physiological changes in salamanders, many organisms are seriously affected by human alterations in natural patterns of light and dark. Ecological Consequences of Artificial Night Lighting provides a scientific basis to begin addressing the challenge of conserving the nighttime environment. It cogently demonstrates the vital importance of this until-now neglected topic and is an essential new work for conservation planners, researchers, and anyone concerned with human impacts on the natural world. Order Ecological Consequences of Artificial Night Lighting at amazon.com.